The smartly designed Sony Vaio VGN-AW21XY/Q Laptop is fitted with a powerful Intel Core 2 Duo Processor T9800 (2.93 GHz, 1066 MHz FSB, 6 MB cache) with Enhanced Intel SpeedStep Technology. This sublime multimedia laptop is fitted with Genuine Windows Vista Ultimate (64-bit) for a full-featured, superior OS performance with excellent levels of security. Running demanding or multiple applications with the Sony Vaio VGN-AW21XY/Q Laptop will be incredibly smooth and trouble-free, and is aided by an impressive 4GB Memory (expandable to 8GB). You'll also have loads of space to centrally store photos, videos, music files and documents, with the integrated 500GB Hard Drive. Two ultra-fast 64GB flash memory SSDs with RAID 0 support are also installed. The Sony Vaio VGNAW21XY/Q Laptop offers up a visual feast, thanks to an 18.4" X-black widescreen LCD with RGB 3-chip LED technology and a stunning Full HD resolution of 1920 x 1080. The integrated Blu-ray Disc player/writer will enable you to watch movies with breathtaking clarity as well as write to Blu-ray Discs for storage of large amounts of data. In addition, the HDMI output lets you connect to a High Definition television for totally immersive movie-watching! 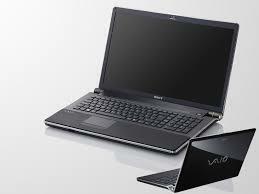 Graphics are capably handled in the Sony Vaio VGN-AW21XYQ Laptop with the NVIDIA GeForce 9600M GT GPU (with a dedicated GDDR3 Video Memory of 512MB). This amazing laptop is ideal for running graphics applications, and displays the full gamut of the Adobe RGB colour space. Adobe Photoshop Elements 6 is supplied - providing you with a wide range of advanced photo editing tools. Whether you are at work or play, the Sony Vaio VGN-AW21XY/Q Laptop delivers an incredible performance on every level!